Tug of the Month: Teal (February 2017) — Olympia Harbor Days | 3-Day Festival Featuring the World's Largest Vintage Tugboat Races! The Tug of the Month: TEAL, 2017 Logo Tug for the Olympia Harbor Days Festival and races. TEAL was built in Blaine, Washington in 1949 for the Alaska Packers Association, the last of their wooden tugs. She was designed by the noted naval architect Edwin Monk, Sr. and his equally respected partners, brothers William and Lorne Garden. This traditional Northwest Coast tug ranged from Alaska to Olympia for the Packers and later for the Tacoma Tugboat Company, in both the salmon fishing industry and the logging industry. TEAL’s design is remarkable. She is described as deep draft, round bilge, plumb stem, elliptical fantail stern workboat, Lorne Garden and Ed Monk’s design number 1500. She was originally powered by an Atlas four-cylinder diesel, which has been replaced by a 1962 Caterpillar diesel engine, freshwater cooled, generating 300 horsepower. The engine change greatly increased her cabin space. Her screw is a 56’ X48” 4-blade wheel. She is 42 feet long and draws 7.6 feet. Ed Monk’s designs were very popular in the mid-20th Century and still in great demand. He and the Garden brothers designed many tugs, but were more well known for their cabin cruisers. A treasured Monk-designed vessel with cabin cruiser lines is the Tarry Not II, one of the last two “Mosquito Fleet” steamers still in operation. Built in 1926, she carried freight and passengers from Shelton to Olympia and intermediate stops, as well as some beach-logging towing. 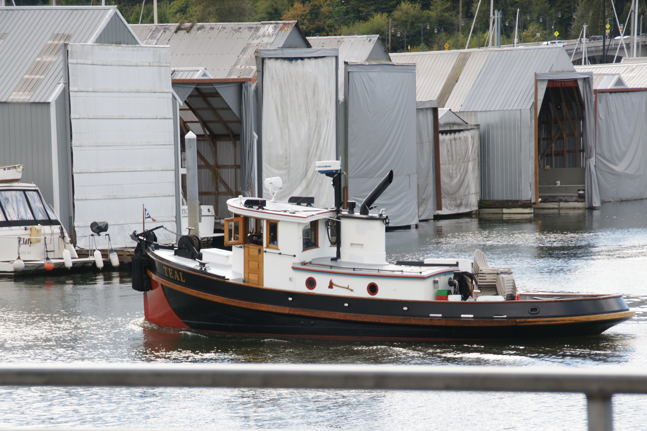 The 28’ vintage vessel is now owned by Steve Wilcox of Sea Blossom Seafoods in Olympia. Monk tug designs, including TEAL, are known for their graceful sheer, the fore and aft upward curve of the hull at the bulwarks or deck level. During her work for Alaska Packers, TEAL ranged from Chignik, on the Alaska Peninsula, to Ketchikan and south to Birch Bay, Washington. She is sometimes homeported at Southworth on the Olympic Peninsula, and is now at the Port Orchard Yacht Club. She still ranges as far as Alaska. TEAL’s racing history is noteworthy. The late Captain Mark Freeman, in his book Tugboats On Puget Sound (co-author Chuck Fowler), shows a Captain Scott Schoch photo of TEAL and Winamac racing in a 1980s Olympia Harbor Days tug race (page 111). She has taken a first place in her class at the Tacoma Maritime Festival Tugboat Race, and in 2016, placed third in the Small Tug race at Olympia Harbor Days. She was recently selected as 2017 Olympia Harbor Days “logo tug” for the upcoming festival and races presented by Olympia Kiwanis. To qualify, she was the oldest “non-logo” tug participating in the Harbor Days races in 2016. Previous to current owner Jan Carlson, TEAL was repaired and restored in Tacoma by Jon and Pat Kent of CA, and before that was owned by Don Leonard of Tacoma, and the Alaska Packers. 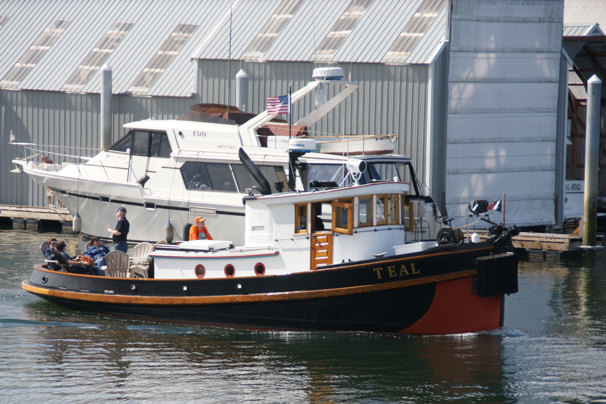 Congratulations to TEAL on her selection as Olympia Harbor Days 2017 logo tug! Sources: Tugboats Illustrated by Paul Farrell, Norton, 2016, Tugboats on Puget Sound, by Chuck Fowler and Captain Mark Freeman, Arcadia, 2009, edmonkwoodenboatclub.org, Ships of the Inland Sea by Gordon Newell, Superior, 1960. About Les Eldridge: Les is president of South Sound Maritime Heritage Association and author of a number of maritime histories and novels of the American Civil War at sea. He lectures frequently ashore and afloat, and narrates the OHD races each year. For more, see EldridgeSeaSaga.com. Tug of the Month is sponsored by Olympia Harbor Days Tugboat Races and Festival, an Olympia Kiwanis Club event. The free community event takes place every Labor Day weekend on the Olympia waterfront. It is in its 44th year. For attendance info see www.HarborDays.com or on Facebook @OlympiaHarborDays. Questions to the Executive Director at info@HarborDays.com.